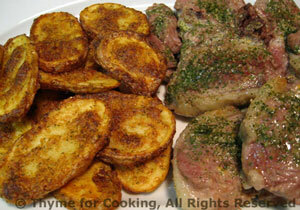 Baked Lamb Chops Persillade, Thyme for Cooking gourmet main course. Persillade is what goes into Escargot Bourguignon to make it so delicious. It goes into a lot of other dishes in France as well. Baking lets the persillade stay on the chops rather than in the pan. Finely mince garlic and parsley together. Place a shallow rack on top of a baking sheet. Brush both sides of the chops with oil. Sprinkle with, and press in, the persillade on both sides of the chops. Place the chops on the rack and bake, 450F (225C) oven for 7 - 15 minutes, depending on thickness. Mine were 3/4" thick (2cm) and I baked them for 7 minutes for medium rare. If yours are 1" thick (2.5cm) I would suggest 8 - 9 minutes. If they are 2" thick (5cm) I would suggest 15 minutes. They will not 'brown' but do stay incredibly moist and succulent.